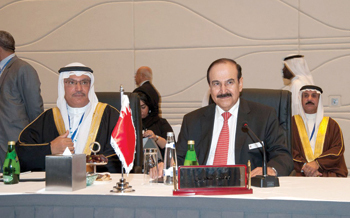 Dr Mirza and Noga general secretary Dr Ahmed Al Sharyan at an OAPEC meet. THE National Oil and Gas Authority (Noga) emerged as the top event organiser in the second half of 2014 as it lined up six major events aimed to enhance the kingdom’s efforts of establishing Bahrain as a hub for specialised international events, conferences and expos. This is part of the efforts of Noga to promote Bahrain as a key destination for specialised international conferences and exhibitions, hone the skills of the technical workforce in the oil and gas sector in Bahrain, boost the national economy and revitalise trade and hotel occupancy, says the authority on its website. Noga organised six specialist oil events during the second half of 2014. One was the first ever international conference on good governance, which was held on September 17 to 18 and organised by Business Event Management. The Operational Excellence Middle East Conference was organised next on September 28 to 30, organised by Energy Exchange – the World Refining Association. This was followed by the Middle East Ethylene Conference and Exhibition, from October14 to 21 at the Gulf International Convention Centre, Gulf Hotel. Organised by the Saudi branch of the American Institute of Chemical Engineers, the theme of the conference was ‘Meeting technical challenges in the ethylene industry through efficient and sustainable technology’. The third International Laboratory Technology Conference & Exhibition (Labtech 2014) was the fourth event scheduled for the second half of this year. The Saudi Arabian International Chemical Sciences Chapter of the American Chemical Society organised the event on October 28 to 30 in collaboration with the University of Bahrain. Several important topics were discussed in the conference sessions, including developments in the petrochemicals and hydrocarbons field, water testing and quality management, recent developments in environmental monitoring, occupational health, safety management and quality systems. The fifth event was the Second Middle East Artificial Lift Conference, organised by the International Society of Petroleum Engineers on November 26 to 27. The next major conference was the third Middle East Maintenance Conference and Exhibition 2014 (Maintcon), which was held from December 7 to 10 and organised by the Bahrain Society of Engineers in coordination with the Gulf Society for Maintenance Professionals. This conference and exhibition is held every two years in Bahrain, with the participation of several large oil companies from European countries, the Middle Eastern and the Gulf. Among the prominent events attended by the Minister of Energy Dr Abdul Hussain bin Ali Mirza was the ‘Renewable Energy for Sustainable Development’ seminar, organised by the University of Bahrain. In his opening speech, Dr Mirza said the scope of renewable energy in the Middle East was high, and in Gulf countries, an abundance of solar energy was something that could be easily harvested. Some forms of renewable energy sources needed to be studied for feasibility, particularly wind energy. He pointed out that large scale wind energy farms have been successfully employed worldwide during the past two decades, while some countries were even experimenting with geothermal and tidal wave. According to the Minister, Bahrain has made environment sustainability an important national priority this year, in pursuit to achieve the United Nations Millennium Development Goal (MDG) targets. He said the United Nations Development Program (UNDP) and Noga had signed a cooperation agreement in 2011 to set up a National Energy Conservation and Planning Centre which will serve as the country’s main reference source for all energy data, providing analysis and planning, and enabling informed decision making. This, in a time when Bahrain’s electricity demand is growing by approximately 7 per cent annually. The Minister said Bahrain has proved its commitment to pursuing the goal of including renewable energy in it energy mix with a pilot 5 MW Solar Energy project, with solar systems at Awali, Bapco Refinery and University of Bahrain. Another 5 MW pilot was being considered by EWA, which was keen on setting up wind turbines to harvest wind energy. Most GCC countries are undertaking renewable energy projects, which will change the region’s future, and move towards more sustainable societies. Another important event attended by Dr Mirza was the second Bahrain International Corporate Social Responsibility Conference and Exhibition. The Minister also received a Bahrain Management Society (BMS) delegation headed by society chairman Dr Adel Hamad, and a number of Board of Directors in the presence of Ali A Jabar Al Sawad, the Noga general manager for Strategies and Planning. They discussed several topics related to International Leadership Conference 2015, which is being organised by BMS under the patronage of the Minister of Energy. Earlier this year, the Minister pointed out the growing need for energy conservation more so during the current times of falling oil price, at a conference titled ‘Options for Energy Conservation in the Oil Refining Industry Conference’. This was organised by the Organization of Arab Petroleum Exporting Countries (OAPEC) in cooperation with Japan Cooperation Centre Petroleum (JCCP) and Noga on February 3, 2015. He said that though energy efficiency and conservation were distinctly different, both played important roles in reducing energy use, lowering investment and operating costs. 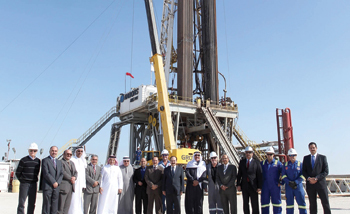 Dr Mirza paid a visit on December 30, 2014 to the site of Deep Gas Well (BD-1) accompanied by Bapco’s Board chairman and members, the management and officials from the oil and gas sector of Bahrain. During the tour, Occidental representatives gave a short presentation on the project in terms of objectives, engineering design and timeframe. This was followed by a tour to the well site facilities and equipment. 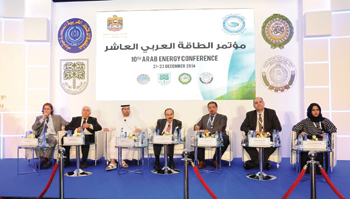 Dr Mirza also attended and spoke at the 10th Arab Energy Conference, held on December 21 in the UAE in the presence of a large number of Energy Ministers and the Organization of Arab Petroleum Exporting Countries (OAPEC) and other member from Arab countries. The Minister spoke about Bahrain’s top oil sector investments, such as Refinery modernisation project and Saudi-Bahrain pipeline project, which connects the oil fields in Saudi Arabia to Bahrain Refinery, which would considerably increase oil imports to Bahrain. He also pointed out the developments in the electricity and water sector and the government efforts and programmes for further streamlining consumption and developing Bahrain’s energy sector. The Minister of Energy Dr Mirza met Russian Special Presidential Representative for Cooperation with Gas Exporting Countries Forum and chairman of Gazprom, Viktor Zubkov and the accompanying delegation, who were on a visit to Bahrain to participate in the first ‘Russia-GCC Trade and Industrial Dialogue’, on December 14, 2014 in Manama. The Minister lauded the bilateral cooperation, and said he was looking forward to stronger relations between the Kingdom of Bahrain and the Republic of the Russian Federation, leading to the progress and prosperity of the two countries.